In 1839, John Lloyd Stephens, an American lawyer, and Frederick Catherwood, an English artist and architect, found themselves in the midst of a civil war in Central America. Why? Let's back up a little. In addition to his legal endeavors, John Lloyd Stephens was an accomplished adventurer and author. He had traveled through and written about Europe, Egypt, and much of the Middle East. Stephens had explored the ruins of the Old World and, after he heard accounts of lost civilizations in the New World, he wanted to explore them for himself. Deciding that he could write a better book about the region, he convinced Martin Van Buren, President of the United States, to appoint him as Special Ambassador to Central America. Partly to help ease travels through the volatile territory and (I'm just assuming here) also partly because as Ambassador, Stephens would get a fancy jacket. "May you be more fortunate than any of your predecessors have been." 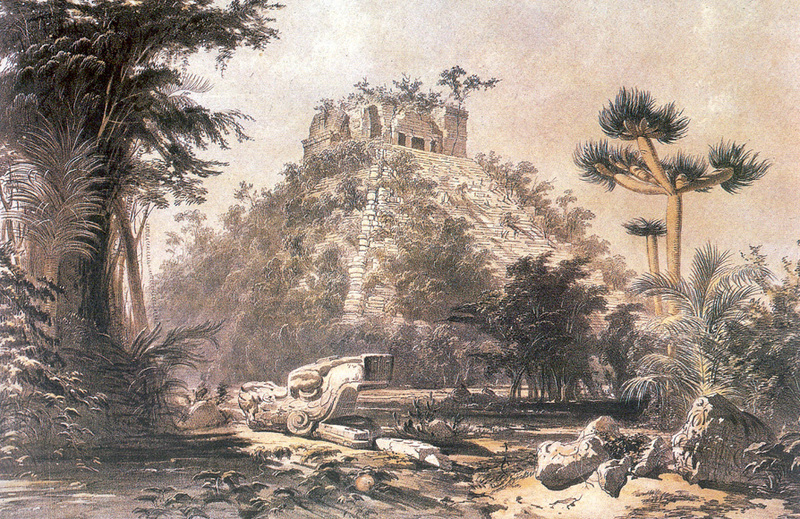 Frederick Catherwood, trained as an architect and educated by J. M. W. Turner at the Royal Academy, had made his reputation as a renowned topographical artist, drawing his way through many trips in the Old World ruins of the Mediterranean. While on his way back to New York, Stephens stopped in London and met Catherwood. They struck up a friendship over their shared interest and experience in Mediterranean travel. They agreed to venture to Central America and see if they, as amateur explorers, could track down some ruins and document what they found. 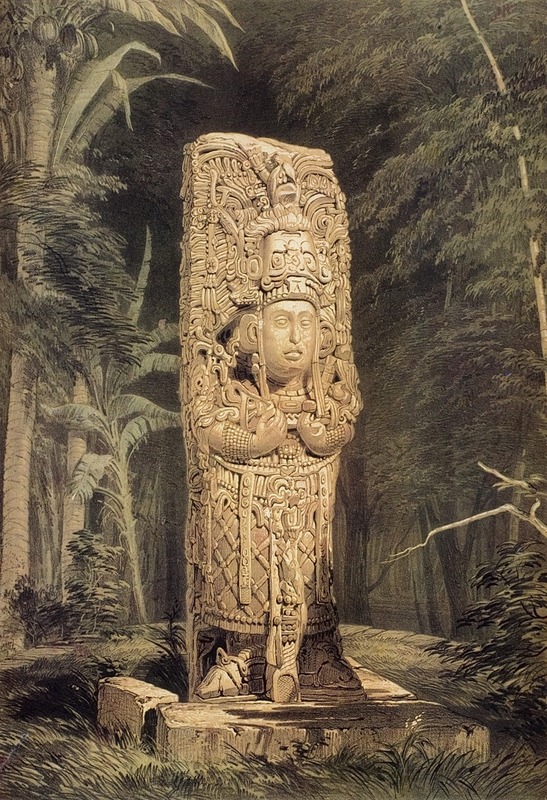 Once in Central America, they hired some guides and began the arduous, weeks long, trek through the jungle heading to Copán. "For five long hours we were dragged through mudholes, squeezed in gullies, knocked against trees, and tumbled over roots. Every step required care and great physical exertion. I felt that our inglorious epitaph might be 'tossed over the head of a mule, brained by the trunk of a mahogany tree, and buried in the mud of Mico Mountain.'" Incidents of Travel in Central America. In fact, one night while camping in an abandoned church, Stephens and Catherwood were abducted by drunken rebel soldiers (that's the civil war bit we first talked about that beginning). Ultimately, they were let go, (due in no small part to Stephen's fancy ambassador jacket, no doubt) and continued on their way. The two came to a river and across it caught sight of a massive, vine covered stone wall. As, Stephens remembers, "We could not see ten yards before us, and never knew what we should stumble upon next. At one time we stopped to cut away branches and vines which concealed the face of a monument, and then to dig around and bring to light a fragment, a sculptured corner of which protruded from the earth." As historian Malcolm McNeil put it, "It would be like finding one statue in Egypt, not knowing yet that the pyramids were there." 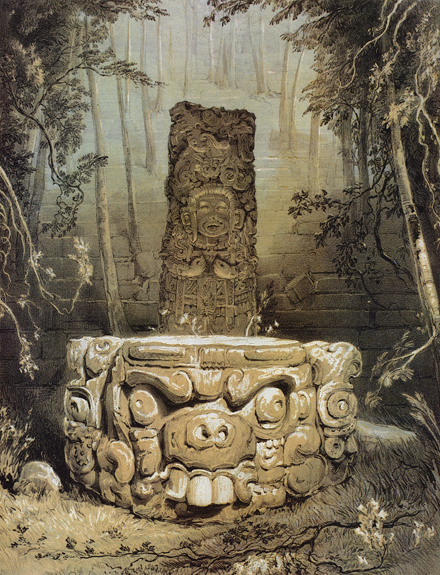 In the end, these two managed to be the first Western explorers to uncover the Mayan civilization. This isn't the last of Stephens' fancy Ambassador jacket, either. When they found the ruins the local land owner refused to sell rights to explore it until he saw Stephens' jacket. It must have been a really nice coat. 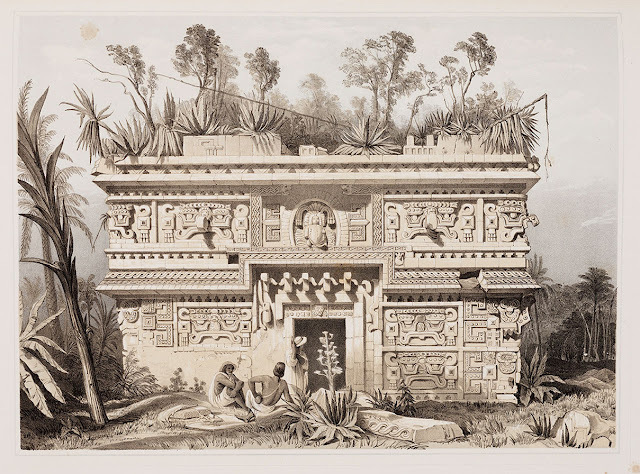 "Catherwood's drawings and lithographs showed without question the Maya were the authors of some of the most artistic and intellectual works of pre-Columbian America. Besides large constructions, they produced works of artistic refinement such as stone and plaster sculptures, frescoes, painted pottery and bas-reliefs in wood. 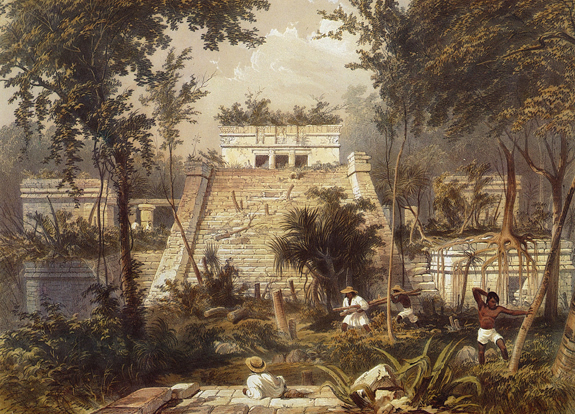 As a result of these explorations, Stephens argued convincingly that the Mayans built the ancient Central American cities, in contrast to the then standard theory that a European civilization must have constructed them." The books that they produced, Incidents of Travel in Central America, and others, would go on to be best sellers. 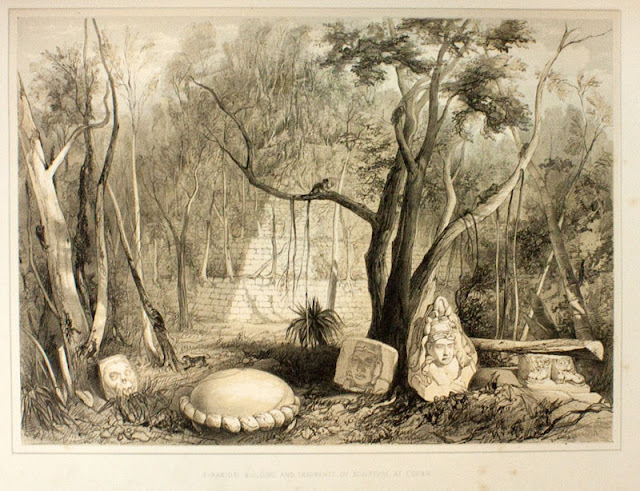 In total, they contained over 200 illustrations by Catherwood. In fact, if you've got $56,000 you can pick up one Catherwood's own original collection of the lithographs. I love the idea of Catherwood, settling in for the day, readying his camera lucida, confident in the knowledge that he had the best job in the world. I first heard of their story through a show called Myth Hunters on Netflix. Unfortunately, for our English speaking readers, the only complete episode I could manage to track down online in is French for some reason. Bon visionnement!